After less than ten years from the suspension (in 2010), in March Sweden has decided to reintroduce the military draft, starting in 2018 from the 1999 cohort. The main reason for this change resides in the rising tensions in the area, mainly given by the pressure of Russia and by the recent developments in the Baltics. That is, the same reasons why Finland never suspended the system, and also why Ukraine and Lithuania have reinstated conscription recently, respectively in 2014 and 2015 (see here and here for a comprehensive overview). 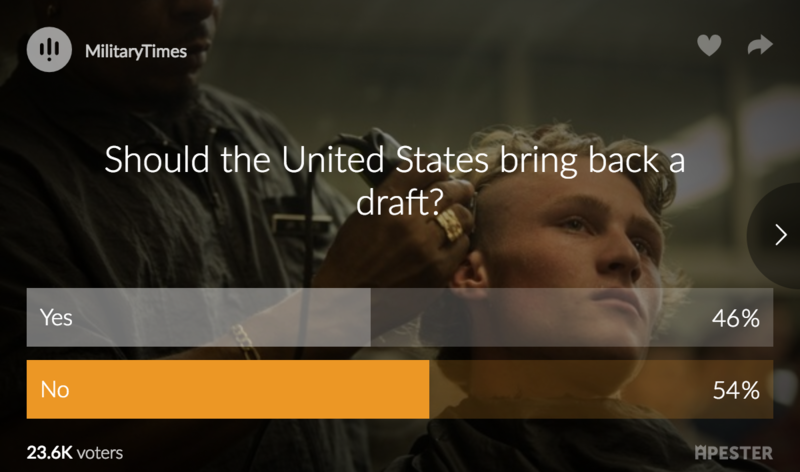 However, the debate on the draft has started again also in the US (see also here). Mainly due to a fake news circulating since 2016 saying that Trump was planning to reintroduce the draft, more than 40 years after the abolition in 1973. However, apart from being a good opportunity to underline the curious military history of the President, it doesn’t seem that the broad consensus for the abandonment of the system had been undermined (see also here). 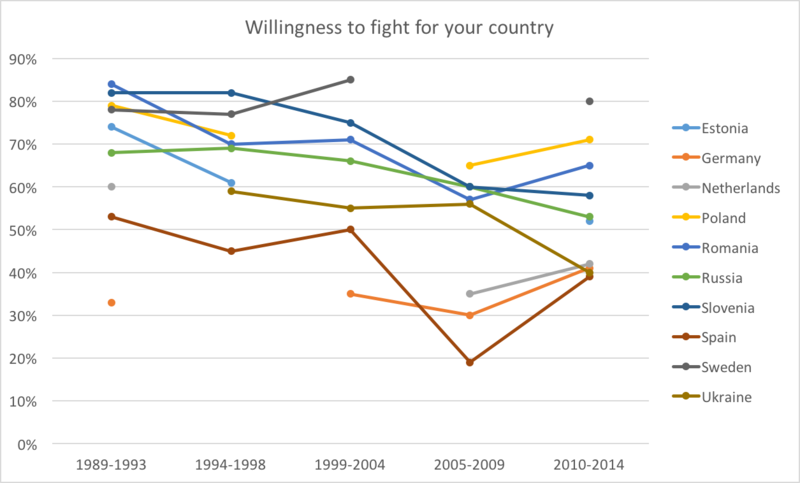 In Europe, most countries have “suspended conscription for peacetime” during the 1990s. Germany – that actually invented modern conscription, introduced in 1644 by the Prussian army –was among the last countries to do so, in 2011. Both West and East Germany made use of the draft, respectively since 1957 and since 1962, but it was particularly relevant in the DDR, where in 1987 (when the number of troopers reached its peak) 50% of the army was made of conscripts. A crucial question is: were the conscripts ever employed in conflicts? We do not know whether German conscripts intervened during the Prague Spring (1968, for the DDR of course), but for sure they were not employed neither in Congo (1973, DDR again) nor in the latest missions of the unified country, in Kosovo (1998–1999) and in Afghanistan (2002-). France, instead, was the first modern nation to introduce universal conscription, after the Revolution. It was a requirement for citizenship, and it was needed to support the military against the counter-revolutionary attempts. After the Revolution, conscription basically followed the need to face the militarization of Germany (in 1870 and 1905). France abandoned the compulsory (male) draft between 1996 and 2001, however, as in many other cases (also in the US), the citizens are still required to register for possible service and to present themselves to the authorities for medical checks and other cognitive tests (the “citizens’ rendez-vous”). Interestingly, also French conscripts did not back the active duty forces (ADF, the regulars) in all the missions of the national army. They were not employed in the Indo-China War (1947–1954) nor in the First Gulf War (1990–1991), but they were utilized in the Algerian War (1954–1962). Why? Because Algeria was part of France, and this formally and internal conflict, requiring a different type of activity. In Spain, conscription was mainly needed for internal purposes: to back up the professionals both within the country and in the colonies. The introduction of the draft, however, was quite difficult. Initially, conscription was not universal and the citizens could pay to avoid the service (the so-called “redención en metálico”). Only since 1912 the system shifted to universal compulsory conscription, where avoidance was punished with jail. Also Spain took part in the European wave of suspensions between 1996 and 2001. Interestingly, internal conflicts play a role also here. Not only the conscripts were employed during the Rif Rebellion (1920–1927), but also both Franco and the Republicans featured conscripts in their armies during the Civil War (1936–1939). 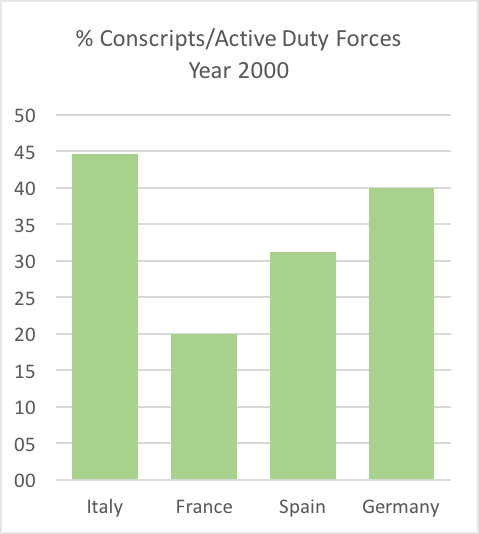 The figures in the links illustrate (1) the number of conscripts, regulars and reserves for Germany, Spain, France, and Italy in 2000 — thus before the suspensions — and (2) the different proportions between conscripts and regulars in the same countries (see here for more on Italy). The following list — as the overview above — helps us understanding why a country should mandate its citizens to serve for the military. The same arguments can be found in recent articles written by a strong advocate of the reinstatement of the draft in the US — Elisabeth Braw (see here and here). 1 — Conscription is the best way to avoid militarism. If the army is rooted in the civilian society, there is less risk of amplifying the effects of specialization, which concentrates a strong military (and aggressive) identity in a selected part of the population. 2 — Purely professional armies cost more. 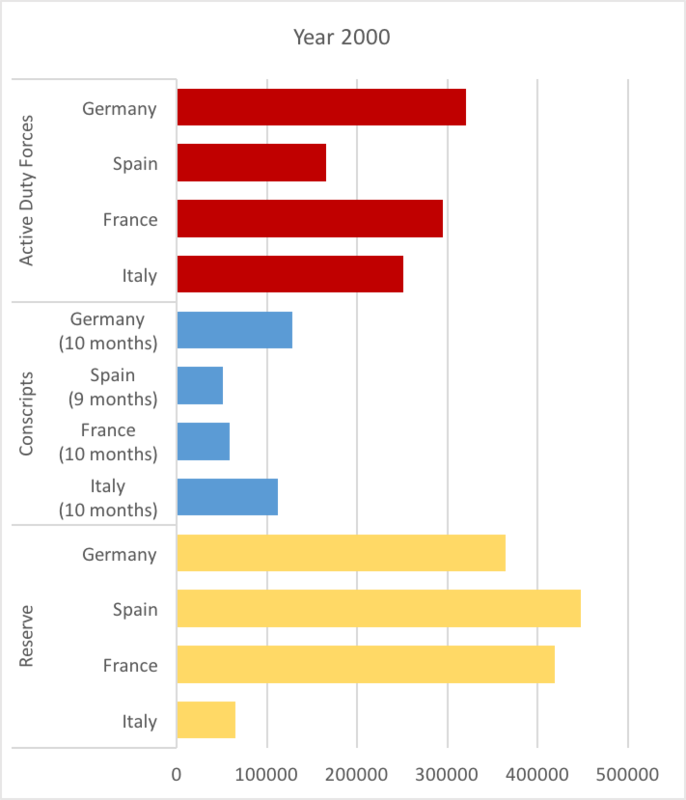 As the US and France demonstrate, abolishing the draft does not necessarily imply reducing defence spending. Of course, if we want to maintain the same number of troopers, having to pay them instead of forcing them to serve raises costs. 3 — It is difficult to find volunteers for senior positions. If you are not somehow forced to get in touch with the military, you would never discover the opportunities that it could give you. 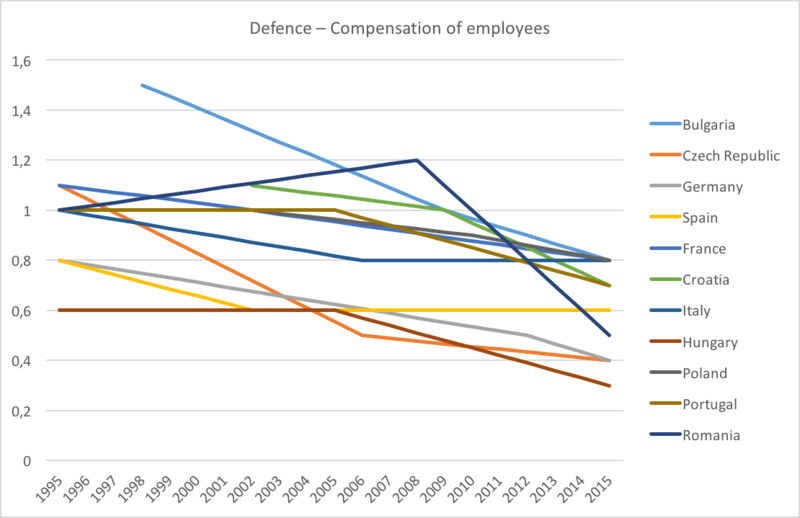 In other terms, the military is not so attractive from the outside. Highly qualified individuals usually do not choose the military career, thus the army has to “cultivate” its ruling class starting from the lower ranks, selecting the best conscripts. 4 — Professional forces tend to be recruited largely from underprivileged groups. In Germany, today, 40% of the regulars come from the poorest regions and social segments of the former East Germany. 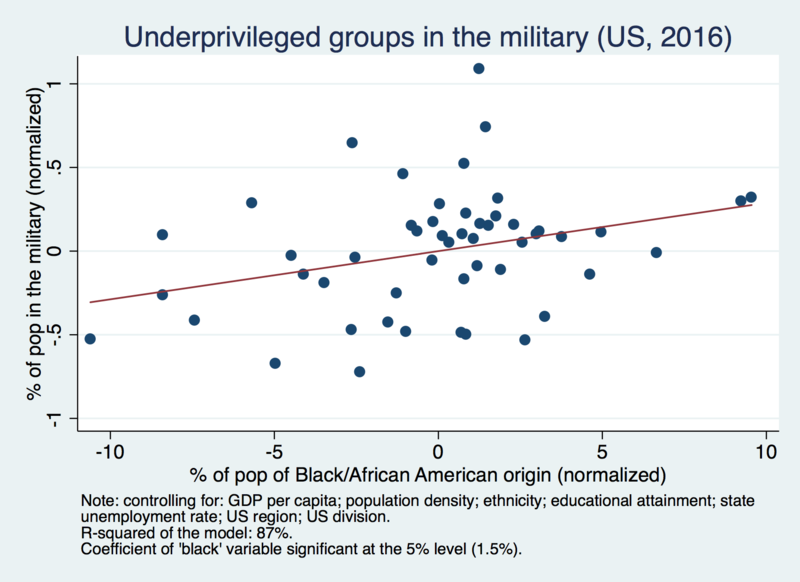 A different scenario applies to the United States: although participation in the military is positively correlated with the state-level share of African American population (see here), the lowest percentiles of the income distribution are under-represented in the US military, and participation in the active duty forces is positively correlated with the state-level GDP per capita (see here). 5 — Conscriptions ensures the continuity of democracy and instills the sense of belonging to a community. This argument calls on a French-style perspective of the army. As in many Asian countries (Korea, Singapore, etc. ), the military service is not only an instrument to defend the country from the outside, but is a way to reinforce tradition, culture, education, and discipline. 6 — “Let’s draft our kids” (2012, and 2017). According to some commentators — especially in the US — universal compulsory conscription would be an effective way to make people think more carefully before going to war. They underline that one of the reasons why the draft was suspended in 1973 was to reduce the pressure on the war in Vietnam, mainly exempting the children of the rich to eventually risk their life. This sort of risk-sharing mechanism would thus act as a ‘veil of ignorance’, making the population wiser (once again, a reasoning that could explain the Asian success of conscription). 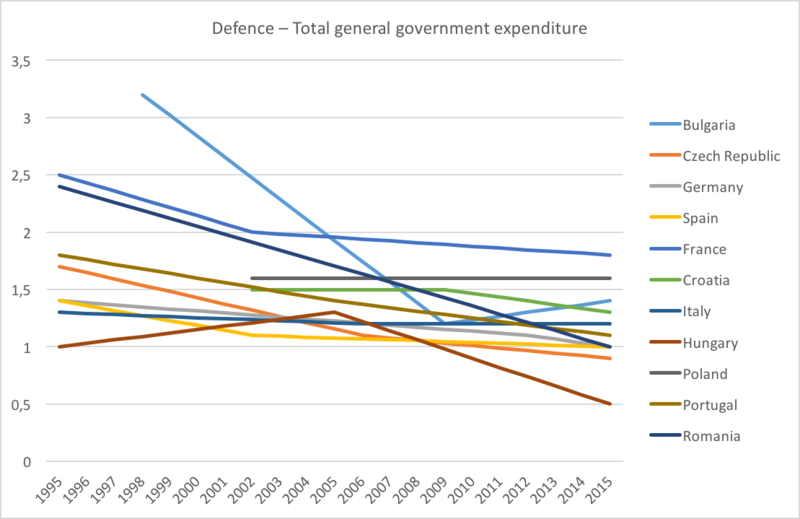 1 — Abolishing the mass draft is a way to reduce the defence spending. Although some nations have not witnessed this decrease, most countries — especially in Europe — actually did. 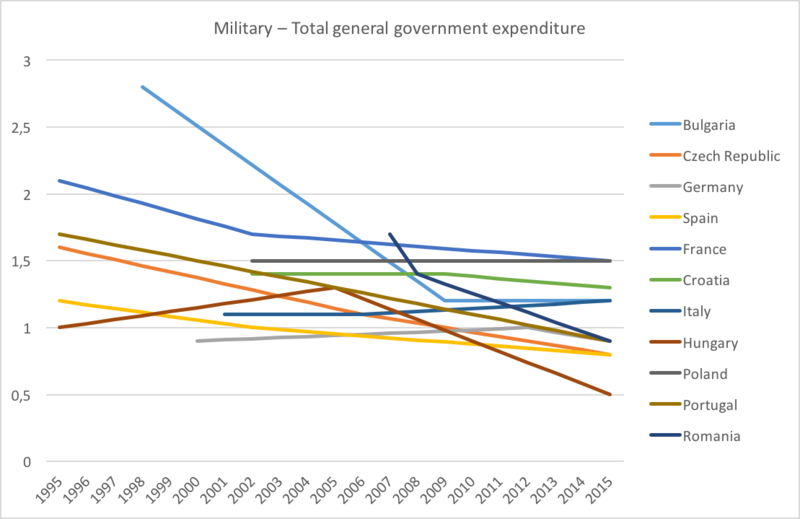 The figures in the links (1–2–3–4) show that, if we focus on the European countries who have suspended conscription for peacetime between 1995 and 2015, we notice that the total expenditure and the expenditure for employees — both for defence in general, and for the military — have generally decreased if compared to the beginning of the 1990s. Most of the lines — constructed on three data points: oldest data, year after the suspension, and 2015 — follow in fact a decreasing or L-shaped trend. This is because, as mentioned above, none of these countries, obviously, removed the draft just to substitute the troopers with an equal amount of professionals. The political will was clearly to move towards a downsizing of the army. 2 — Conscription does not affect the ability to act in conflicts. As we have anticipated, conflicts — especially if external — are always the domain of a quasi-professional army. And this is even more evident as time passes. As Doug Bandow underlined in 2002, anti-terrorism missions require élite forces, while «masses of cannon fodder are of dubious value even in a typical conventional war today». Conscripts were quite useless — military speaking — in the 20th century, they are even more so in the age of highly technological conflicts. 3 — Too short to be useful. In this context, timing is crucial. During the wave of suspensions, many military commanders had clearly acknowledged that the current state of the system, with services usually ranging between 9 months and 1 year, didn’t make sense. Modern military requires specialization, while these short trainings only implied losing specialization in the civilian occupations to gain no effective improvement in defence skills or discipline. 4 — Instill militarism. Although a mass army could be a way to democratize the military, it is equally plausible that it could actually foster militarism. It brought people into an intensive contact with the ideals of war, comradeship, nationalism, self-defence, aggression. Is this something we want to invest in? 5 — The rich can avoid it (as anyone else). 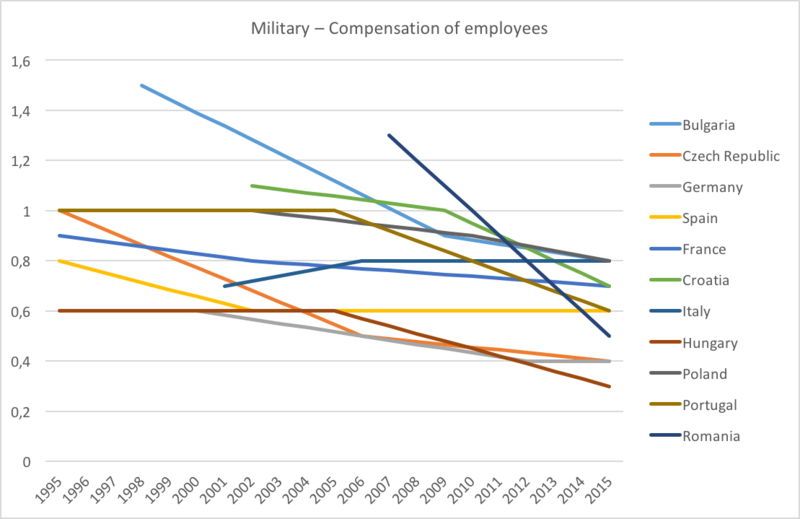 In Germany, in 2005, only 14% of the conscripts actually served in the military, while over 30% of the conscripts chose alternative services, and the rest could avoid the draft, mainly for medical reasons. This raises one point: once we respect individual rights and grant freedom to the citizens (hopefully), any possible cultural or social effect of ‘forcing’ is strongly mitigated. The bottom line is that those who want (and are able) to avoid the service, will do it. Thus no real risk-sharing will be in place. 6 — The world is (a little bit) safer now. 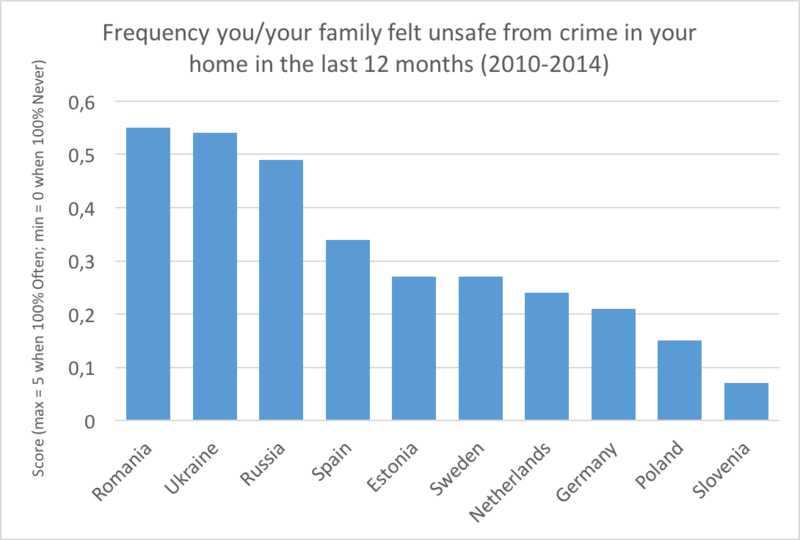 The demand for protection from military offence is lower, now, and people probably feel a higher need to be protected from immigration or criminal offences (see the results of the World Values Survey: 1–2–3–4–5). Of course, we cannot say that a war involving European countries is unlikely, but it is much less likely than in the past. If we look at the Global Peace Index, we notice that Europe is the safest continent on earth, together with Oceania. The transition for the ex-communist countries is now almost complete, together with their integration within the EU. France and Germany, although sometimes not coordinated at their best, do not fight against each other anymore. Of course, the Eastern problem is not completely solved. Russia, Ukraine, and the Balkans are still at risk, but the nature of the issue has evolved since the 1990s. And giving less relevance to national armies (also with conscription) is a good way to promote further European integration, for example moving faster towards the creation of a European army (see also here). 7 — A long list of bad economic consequences. Conscription — in any form — has a high economic and social cost. And in fact, as David Henderson underlined, the economic science has greatly contributed to changing this particular policy. Conscription is a huge and open violation of individual and economic freedom (Milton Friedman would explicitly define it ‘slavery’), it has a very high opportunity cost — since it diverts a considerable share of the young cohorts from their main occupations (at least partially) –, it generally delays the entry of young people in the workforce, and it makes people lose their comparative advantages — generally slowing their human capital accumulation process. As Walter Oi stated, “conscription is a tax” (remember the Spanish “redención en metálico”?). It also gives low incentives to the army to invest in technological progress, in order to use more capital instead of manpower. Moreover, in several countries (see here for a literature review on this topic) conscription is related to lower graduation rates and lower individual earnings (along the entire life cycle). Elisabeth Braw, however, would argue that there might be other relevant positive economic effects from bringing back the draft, namely: a) to force the young to invest in human capital; b) to reduce unemployment (through public spending, of course); c) to pool together people from different social, economic, and cultural background, thus promoting a sharing of experiences and competences otherwise out of scope. And she advocates for a new version of the draft, of course: targeted, highly selective, and open to both men and women. But here many questions arise: Is this what the military is for? Can we obtain the outcomes with alternative investments (in education and infrastructures, for example)? 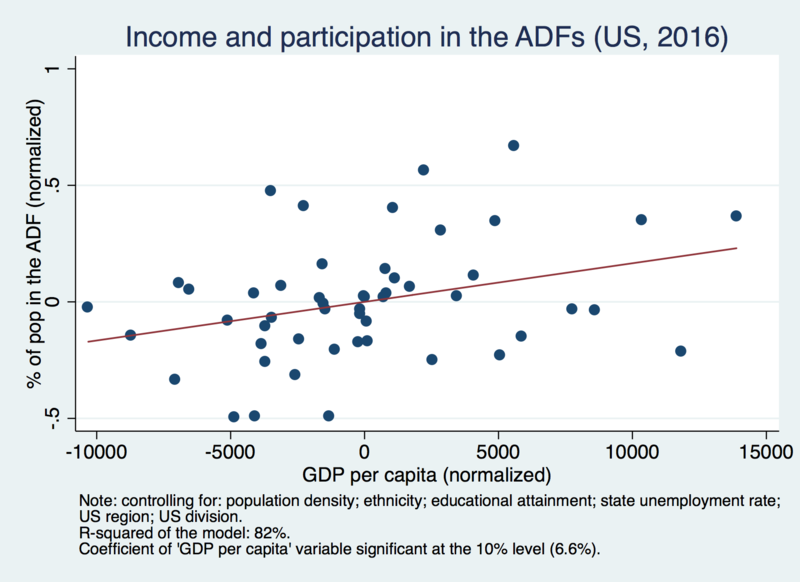 What is the social and economic cost of these results? Are the alternatives better, socially and culturally? Can we attract people in the military without forcing them in to it? At least for the last two questions, the answer is yes. For one simple reason: the only advantage of obtaining these outcomes through the military service resides in what is the peculiarity of the army: building an effective ‘command economy’ within the country. There are some cases (e.g. natural disasters, conflicts), in which the best response a society can give to solve a problem is to reduce freedom and instaurate a highly hierarchical social structure (for the specific purpose and context). To train people in the military is convenient only in view of this purpose, and never forgetting it is a high-cost investment. In any other respect, universal compulsory conscription is only an anachronistic relic of the past. As we have briefly pointed out, there is a new actor on the political and social stage, compared to the old times when conscription was introduced: women. Norway extended conscription to women, in 2016: how is it going? Would a reintroduced conscription be different, in view of this? What do women think about the role of the military? Answering this question would enable us to better understand how things will develop in the future. Will women (see here, for example) help in building our societies on different grounds?